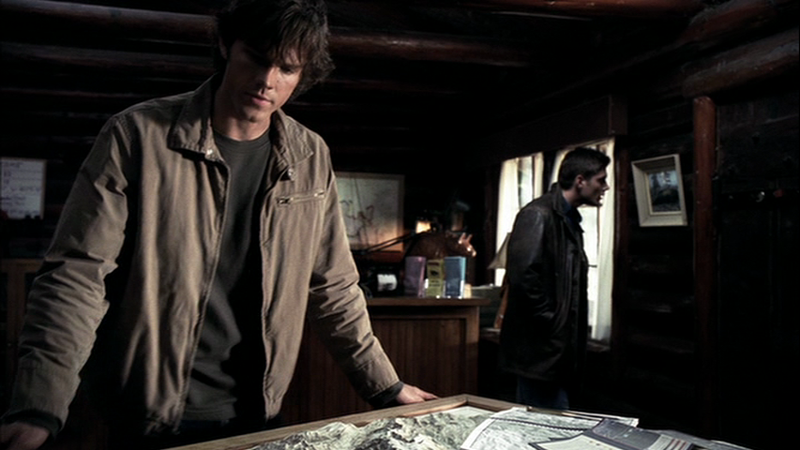 Wendigo (1x02), Sam wears the long-sleeved T for the entire episode. In Hookman (1x07), Sam wears the long-sleeved T for the entire episode. The left sleeve is destroyed below the elbow by the paramedics who tend to Sam’s arm. FATE: Presumably thrown out after Hookman (1x07), because the paramedics who tend to Sam’s left arm cut the sleeve off at the elbow. Sam seems to have more recurring clothes than Dean, or is it just you are concentrating on Sam first or leaving out Dean for later? It's because I decided to post from my unique T-shirt file first(which on my computer includes long-sleeves, polos and henleys too)...and Sam wears the unique T-shirts in the family. So, yes, it's just that I'm accidentally focusing on Sam first. Actually, I think it's Dean that has the more limited wardrobe of the two brothers...at least in the first season. I haven't gone past 2x02 yet. I will eventually get to Dean, I promise. I'm trying to post at least once a day to this project, but sometimes I get busy and/or forget.